And Then There Were Even More…. Because we really really needed more poultry. The thing is, no one tells you how addictive poultry is. Or that poultry is the “gateway” livestock. You get a hen or two, thinking fresh eggs, how quaint. Then you realize how funny and cool chickens are and you think how neat it might be to have one of those rare breeds that looks pretty out in your yard. Before you know it, you’re poring over poultry catalogs, checking out the amazing varieties of plumage and egg colors, checking to see what breeds will hatch their own eggs and who the best layers are. Then you think maybe you can sneak a guinea fowl or two in there because why not? You already have chickens, it’s not so much of a stretch! Besides, they eat ticks and chase away strangers! 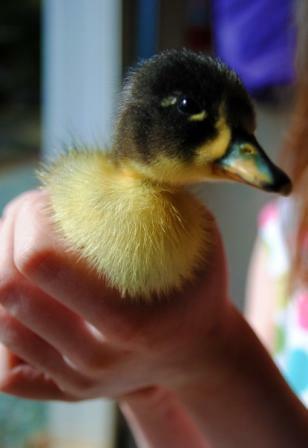 Have you SEEN those adorable ducklings at Tractor Supply? Heck, if I am going this far, why not go all out and get some goats! And a llama! And……well, you get the picture. 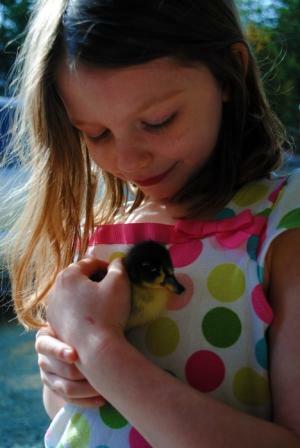 We brought home two new ducklings – they’re Pekin/Runner crosses, and they are being called “Fanny” and “LeQuack”. We have no idea what genders they are. Also we have two small chicks of unknown breed/gender. It’s a risk, but they were too cute! One is a tiny yellow puffball with black spots, and the other is a dark brown with some orange. 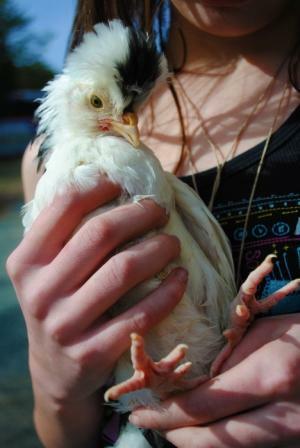 We were told it’s an Ameraucana but I just noticed it has feathers on it’s legs, so I am not so sure! Finally there’s two of these Mottled Houdan girls. I am in love with the feather hat! One is for Susie. Our friend Jenny named her “Liberace”. The one we are keeping has been named “Delia”. Soon Paul’s going to have to talk me out of geese and turkeys! This entry was posted in Kids and tagged Pets. Bookmark the permalink. I love the duckling and the Mottled Houdan! So cute. 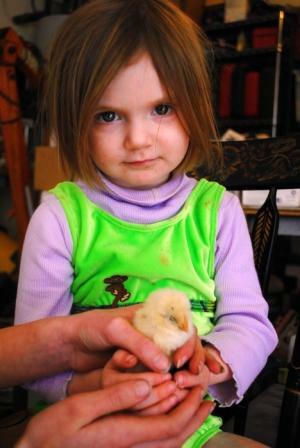 OMG – so true, so true, chickens are just the beginning of a long and slippery slope! My BFF has gotten me hooked on your blog and this is so true. I got five chickens for Mother’s Day last year and I really want to add a turkey or two, some quail and maybe even some pheasants. I wish I had a bigger piece of property so I could have a cow too… HEHEHE!